Here's a long post for you but what can I say.. I like to write. Earlier this past week I had dinner with my good friend Mike, who also happens to be my dentist (and a very good one at that). He suggested Macaroni Grill, which sounded fine to me, so we met at the one in Arcadia. 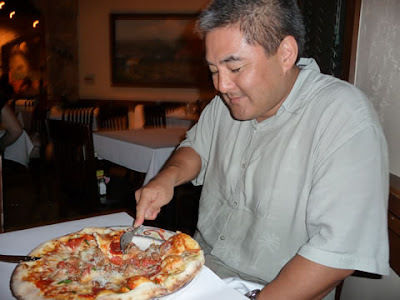 Here's Mike about to enjoy his pizza. Mmm, looks good, better than what I ordered. Here's a close-up of the pizza. I didn't sample any, but the crust is what makes it look good. 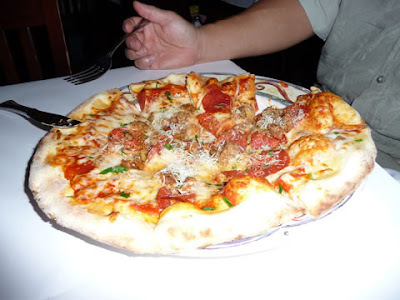 The key to any pizza is the crust - that's my pizzaometer measure of how good or bad it is! MG has six dinner specials for $11.99 that include the salad, entree and dessert. I asked our server if the portions were the same as from the regular menu to which he answered in the affirmative, so I figured why not. For seventy cents more I could add a salad and dessert. 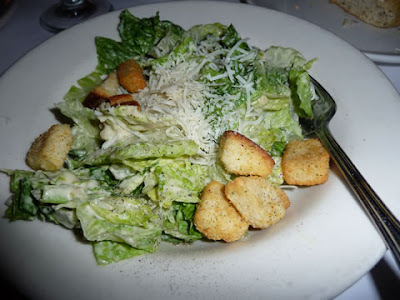 Here's the caesar salad. And here's my chicken entree, pollo magro, i.e., "skinny chicken." It was the lowest calorie item on the menu and I figured after having about 10,000 calories of soul food with Katie on the weekend, I shouldn't indulge too much again. I don't know why they put chopped tomatoes on top of the chicken - it did nothing for the dish especially since they had no taste. Although we have a dental plan at work, it's really crummy. It's one of those plans in which the participating dentists are encouraged to spend as little time as possible doing the "covered" work and instead try to sell you all these extra services that are full-price. That's why they spend about 3 minutes cleaning and inspecting your teeth when you go in for a checkup and about 20 minutes giving you the hard sell on having cosmetic dental surgery. And that's why I would rather go outside the plan and have someone with integrity like Mike do the dental work. My dental experience with the dental plan at my workplace has not inspired confidence, to say the least. Monday afternoon I checked out MG's web site for the nutritional information on their menu items. It's horrifying. Restaurant food is filled with calories and sodium (you probably already knew that). Looking for a "healthy" menu item is pretty easy because there isn't much to choose from. One salad looked tempting until I saw it contained 5,460 mg of sodium. I thought it was a typo, but this same salad appears on the Men's Health list of the 20 saltiest restaurant dishes in America, as the saltiest salad. 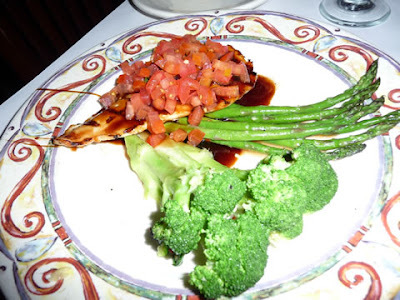 Instead I opted for the pollo magro, which had the healthiest main course numbers. But then I added a caesar salad and dessert, so I guess I thwarted my own efforts to be healthy, lol. During dinner Mike complained to me about the horribly rude drivers he encounters when he takes his daughter to school. That's what it is like driving in the San Gabriel Valley in general, except his is a more concentrated experience since it packs a larger number of drivers into a smaller geographical area as well as time frame. If it were a planet, its concentration would be so dense as to prevent even light from escaping its gravitational pull. I told him that's no different from shopping at the Alhambra Costco except you are dealing with shopping carts instead of cars. The contest announcement below is in this month's Costco Connection magazine (click on the picture for a larger version). 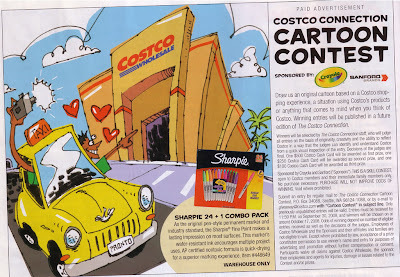 It asks you to submit a cartoon based on a Costco shopping experience or product. All I could think of was submitting a cartoon dealing with potential injury claims arising out of the pushing and shoving going on over the food samples at the Alhambra location, or out of control shopping carts and the out of control people pushing them up and down and across the aisles. Anyway, back to Mike's driving story, a few days earlier he was driving his daughter to school when some woman behind the wheel of a Camry changed lanes a plowed into the side of his car. The impact made her fender come off, yet she just kept driving as though nothing had happened. Mike said it was actually kind of comical that anyone would try to ignore something this big and keep driving. Finally after persistently following behind her, honking his horn and flashing his lights, the woman pulled over. He walked up to her car and asked for her license, registration and proof of insurance. She started babbling and was uncooperative until he also pulled out his sheriff's badge (he's a reserve sheriff for the county), at which time all of a sudden she shut up and started taking him seriously. Meanwhile this woman's poor daughter sat covering her face with her hands. Ah, I've always thought someone should produce a video game called "Driving in the SGV" in which the player, behind the wheel of his virtual car, encounters an onslaught of vehicles lunging at him or her from every conceivable angle, breaking every conceivable rule of the road and lacking even the slighest modicum of courtesy. But then why do that when you can just take a trip to the actual SGV and experience it in real time. Hmm.. sounds like a potential tour package. Three days, two nights, rental of a reinforced vehicle.. I wonder if Costco would be interested in sponsoring this?